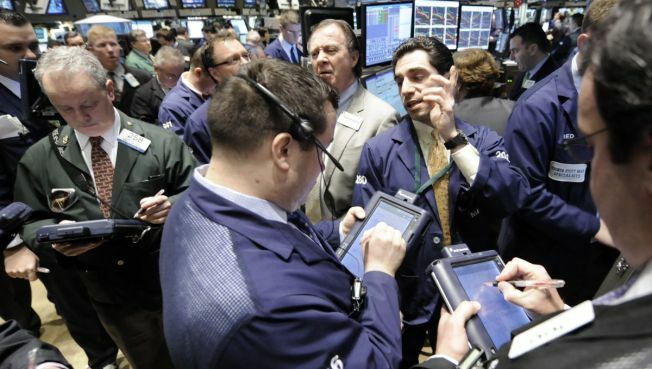 Traders gather at a post on the floor of the New York Stock Exchange on Wednesday. NEW YORK — Investors acted Wednesday like they had overdone it a day earlier. Wall Street snapped back from a steep sell-off Tuesday with a rebound in the same financial stocks that were pummeled Tuesday. Some upbeat comments from banks, stronger-than-expected results from IBM Corp. and hopes that Washington will offer more help to the economy powered a rally that recovered most of Tuesday's losses. The Dow Jones industrials surged more than 275 points and all the major indexes rose more than 3.5 percent. Some bounce would have been expected after the Dow tumbled 332 points Tuesday but forecasts from PNC Financial Services Group Inc. and Bank of New York Mellon eased concerns that the troubles at financial giants like Citigroup Inc. were hitting all banks. IBM surprised investors late Tuesday with a forecast for the year that was well above what analysts had been expecting. It reported a 12 percent rise in fourth-quarter profit that easily beat analysts' estimates. And Swedish wireless equipment maker LM Ericsson also reported earnings that topped predictions. Banks reversed double-digit drops from Tuesday with double-digit gains. PNC, which acquired National City Corp. on Dec. 31, jumped 37 percent after saying it would turn in a profit for 2008 and continue to pay its dividend. And Bank of New York Mellon Corp. rose 23 percent after reporting that it managed to eke out a profit for the fourth quarter. Citigroup Inc. surged 31 percent after falling 20 percent Tuesday, while Bank of America jumped 31 percent following Tuesday's drop of 29 percent. Kim Caughey, equity research analyst at Fort Pitt Capital Group, said the comments from PNC and other banks and results from IBM made clear that while it's a difficult time for businesses, not all are struggling as much as some financial companies. Investors looked again for insights into what steps the new administration will take to shore up the economy. President Barack Obama's Treasury Secretary nominee, Timothy Geithner, asked Congress to act quickly and forcefully to deal with financial crisis. Appearing before the Senate for his confirmation hearing, he said Obama is working to foster economic recovery and "get credit flowing again." According to preliminary calculations, the Dow Jones industrial average rose 279.01, or 3.51 percent, to 8,228.10. Broader stock indicators also gained. The Standard & Poor's 500 index advanced 35.02, or 4.35 percent, to 840.24, and the Nasdaq composite index rose 66.21, or 4.60 percent, to 1,507.07. The Russell 2000 index of smaller companies rose 14.69, or 3.39 percent, to 448.34. Investors often turn to smallcap stocks when placing bets on a market recovery.